Besides a system of diseases, Linnaeus also set up a catalogue of the properties of medicines. He divided medicines by taste (tasteless, sharp, bitter) and by smell (pleasant and strong). He maintained that the former affect the fibrous system, whereas those that smell, that is, aromatic substances, have an impact on the nervous system. 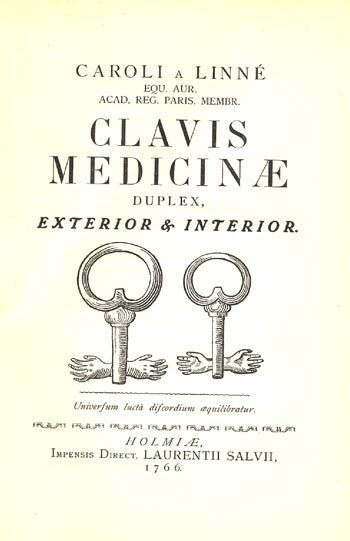 Clavis Medicinæ is a book on systematizing medicine and is regarded as perhaps the most influential of Linnaeus’ writings in the field of medicine. Substances are divided into classes and orders, and within each order compounds are collected primarily from the plant kingdom. This is accounted for by the candidate J. T. Fagraeus in the 1758 dissertation ”Strong-smelling Medicines.” The publication Materia medica (1733) and the dissertation ”Observations in Materia medica” (1772) provide an inventory of plants that are used for medicinal purposes. The compilation takes up facts about their use and effects. The information had been gathered from a number of countries outside of Europe. The plants are given with their genus and their trivial names.